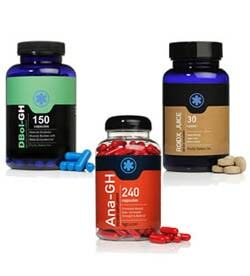 Main Goal: Muscle Gain - Weight Gain - ANA-GH is a new formula that replaces Anadral (Anadrol). It is an incredibly effective supplement for promoting weight gain, and gaining strength. ANA-GH is a favorite bulking compound used by elite power lifters, it is highly effective in promoting extensive gains in body mass by greatly improving protein synthesis. When used to "jumpstart" bulking cycles, ANA-GH causes a rapid yet equal buildup of strength and weight. Due to its high water retention properties, use ANA-GH to protect/lube joints while lifting heavy weights. Main Goal: Muscle Gain - Dian-Bol, take 2 Tabs with/without food anytime. Made for real world results muscle gain and strength gains, implementing a version can be brought in without compromising the stability. For most Dian-Bol is very safe as long as you keep in normal dosages under 2 tabs daily, you shouldn't experience any side effects or need any anti estrogens. Typical cycles are 3 months on then at least 2-4 weeks off. 60 tabs -30 day supply. What is Weight Builder 3 (DBOL, Roid, ANA-GH) Used For?